Conservation Alliance International (CA) in collaboration with Wildlife Division of the Forestry Commission in Kakum, has organized series of training activities for farmers fringing the Kakum National Park under the project, “Reducing human-elephant conflict through improved monitoring, stakeholder engagement and law enforcement”, with funding from the African Elephant Fund (AEF). Since 2017, over 250 farmers from 10 worst-hit in terms of elephant crop raid (Gyeaware, Mmaa ni aye, Nfuom, Bobi, Afeaso, Abeka Nkwanta, Nyamebekyere, Srebourkrom, Aboabo Camp and Kasim)within the landscape have benefitted from the training. A training on biodiversity conservation and elephant crop raid prevention techniques is the most recent intervention in terms of building capacity of communities for elephant conservation in Kakum. In an interview, Mr. Enoch Ashie, the Park Manager of Kakum Conservation Area (KCA)mentioned that the planting of palatable crops (maize, cocoa, among others) close to the park boundary by farmers has led to the hike in the incidence of elephant crop raids within the landscape. He added that farmers would need to adopt new and sustainable techniques to deter elephants from raiding their crops such as the cultivation of non-target crops. Farmers engaged also attributed the incidence of elephant crop raids to the same challenge of expansion of farms into forested areas in a bid for fringe communities to increase productivity and household income. The training was, therefore, a good opportunity for them to learn about elephant conservation and crop raid prevention techniques such as chili-pepper grease fence. 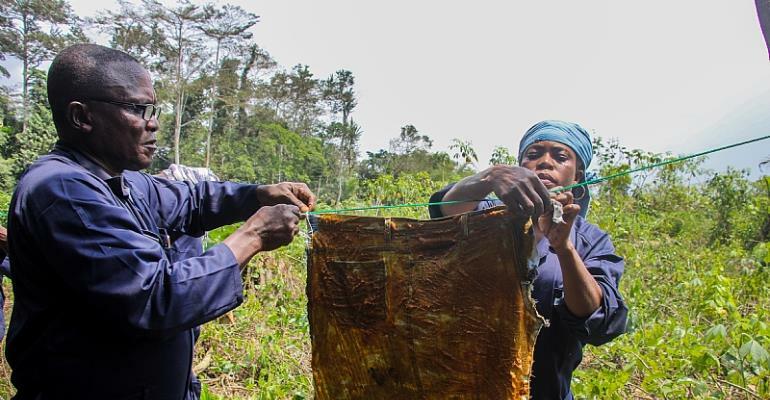 In an interview with Mrs. Tina Anie, the Community Relations Officer of the Wildlife Division-Kakum, she stated that farms with chili-pepper grease fencing, are not likely to be raided by elephants. Mrs. Anie recommended that,farmers should employ these cost effective techniques to deter elephants from raiding their farms. She reiterated that “planting chili pepper around farms will not only prevent elephants from raiding their crops but can also be a source of extra income when the pepper is harvested and sold. The project also supported 35 lead farmers with farm inputs such as farm boots, protective clothing, raincoats, torch lights, machetes, gloves. Miss Abigail Frimpong, the Project Coordinator at CA, indicated in an interview that the lead farmers are expected to support the rest of community members to adopt these techniques to reduce conflict with elephants and increase food security. In recent times beehives are also showing a high potential to ward off elephants from farms as the bees cause severe irritation to elephants that get close to them. This new development offers farmers with triple opportunities by saving farms from crop raids, provide extra income when honey is harvested and sold and finally when the bees improve pollination of crops thereby, increasing crop yield. Beneficiary farmers of this intervention have expressed their profound gratitude for the support and pledged to lead the way to reduce human-elephant conflict in the area. They were also ready to share their new knowledge with others in their respective communities and appealed to the government to strengthen extension services to farmers in the area.